I almost NEVER create new recipes from thin air. Mostly I look around the internet or through cookbooks to see what catches my eye. Sometimes this search will stimulate a fresh idea of my own, Most often, I work with a recipe, adjusting things here and there to meet my family's tastes. Every once and awhile I come up with an idea on my own. This is one of those rare times. What to cook every day can be a struggle. You just run out of ideas as food becomes a daily grind. During Vancouver Fashion Week, I had so little time I picked up a variety of pre-made meals from Momma Costco as we call her here - Shepherd's Pie, Stuffed Peppers, Pork Tenderloin Stroganoff, etc. When it was all over I was totally exhausted and struggled to put anything on the table. It was time to get my hands dirty in the kitchen again. I did a power shop at Safeway, grabbing anything that might work for a few meals. One item was a large can of chunky tuna in water. There are several easy go-to's for this such as open face tuna and cheese sandwiches (broiled to melt the cheese) and tuna casserole, but my mind began to wander down other avenues. Up popped the thought of individual tuna pot pies. I didn't have time to make a pastry top, so first considered corn bread like you would get on a tamale pie. But as I walked the grocery aisles, polenta came to mind. Polenta is one of those wonderful foods I never heard about growing up. It wasn't until a few years ago that it started to appear as an appie at high-end events. I loved it from day one. While I have only attempted one recipe before, it's a goodie - Polenta Torte with Ham, Spinach and Cheese. The article I wrote also has links to tons of others to try. I grabbed a pile of random vegetables, set out my cornmeal and started to work. This recipe did take time to prepare, but you can do it in two stages. 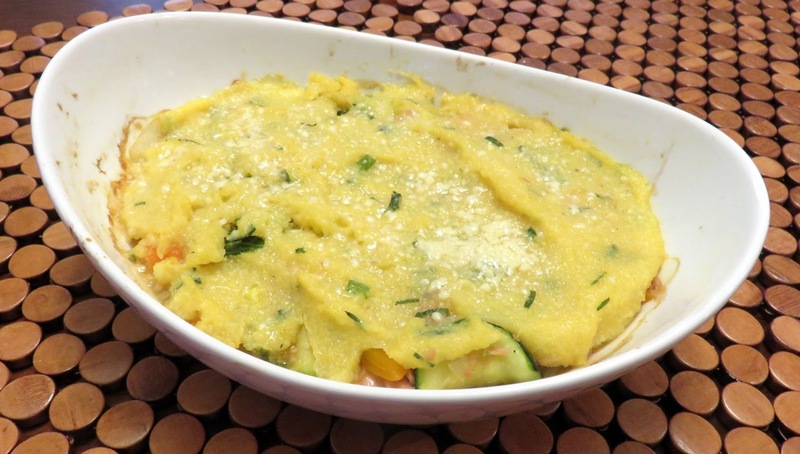 The vegetable/tuna pot pie mix can be made earlier, placed in oven proof bowls and set aside. Then about 30 minutes before supper, prepare the polenta, spread it on top of the pot pies and pop them into a pre-heated oven. Best of all - my husband who doesn't get excited about food said it was a keeper. Not gourmet, but a warm hearty meal for a cold night. Optional - 1 T Cornstarch to thicken broth. In large frying pan, add onion, garlic, celery, mushrooms, carrots and about 2 T of olive oil. Saute on medium until onion is soft and carrots are just starting to get tender. Add pepper. kale, zucchini and butternut squash. Cook until the new vegetables are crisp tender. Add your broth (with cornstarch mixed in if using) and tuna. 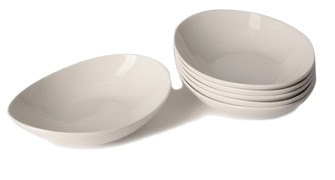 Heat through and then divide into 4 large oven-proof individual bowls. Mine are oval shaped pasta bowls. Preheat oven to 425 degrees. Place the 4 C of regular strength vegetable broth, salt, chives and butter in a sauce pan and heat to boiling. Slowly pour the cornmeal into the broth in a steady stream stirring constantly. Turn heat to low. 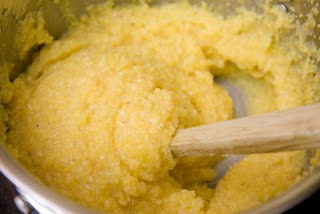 Continue to stir slowly while the polenta cooks for 10 minutes. Spread 1/4 of the polenta on top of each of the four pot pies - about 1 cup per pie. Sprinkle the top of each pie with 2 T of cheese. Place in pre-heated oven and cook for 15 minutes. Serve. It's important to note that guests know these bowls are extremely hot. BUT the beauty is the food stays hot from first bite to last. Enjoy!